Americans are increasingly installing wind turbines near their homes, farms and businesses to generate their own energy, concludes a new report released today. 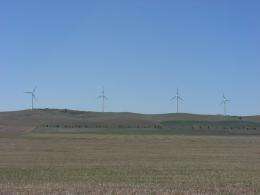 The 2012 Market Report on Wind Technologies in Distributed Applications is the first comprehensive analysis on a growing field called distributed wind, which involves generating wind energy close to where it will be used instead of purchasing power from large, centralized wind farms. Distributed wind can range from a small, solitary turbine in someone's backyard to several large turbines that power a manufacturing facility or a neighborhood. "The public often pictures large wind projects with long rows of turbines when they think of wind power," said the report's lead author Alice Orrell, an energy analyst at the Department of Energy's Pacific Northwest National Laboratory. "But this report provides detailed data that shows this image is incomplete. Many of the nation's turbines are for distributed, not centralized, wind projects." PNNL wrote the report for DOE with support from energy consulting firm eFormative Options, the Distributed Wind Energy Association and the American Wind Energy Association. While the total number of distributed wind turbines installed in 2012 declined by nearly 50 percent, the amount of power those new turbines could potentially produce increased by 62 percent. This shift is mainly because more large turbines are being used in distributed wind projects.